Before I go further into Solomon's remineralization strategies, you have to know more about those minerals I mentioned vaguely in my leaching post. Although there are a slew of minerals plants use in large and small quantities, Albrecht (and those who have built on his work) are primarily interested in the calcium (Ca), magnesium (Mg), potassium (K), and sodium (Na). Albrecht believed that prairie soils provide optimal crop nutrition, so he suggested we mimic the ratio found there: 68:12:4:2. Other practitioners have suggested slightly different values, such as 62:18:4:2 for sandy soil, or 85:5:2-4:1-2 if you're following the work of Victor Tiedjens and think calcium is of most interest. If you remember high school chemistry, you may recall that these four minerals are all cations, meaning they're positively charged and are attracted to negatively-charged clay and humus particles. The amount of negatively charged spots in the soil isn't unlimited, though, so there's only so much space to go around (measured as the cation exchange capacity), and all cations don't cling equally tenaciously to the spots that are available. Calcium is strongest, followed by magnesium, potassium, and sodium, in that order, so if you dump masses of lime (calcium) in the soil, calcium will fill all of the spots, bumping off the weaker cations. 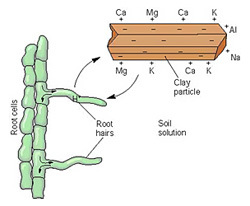 Meanwhile, if you only add a moderate amount of calcium, only the lowest cations on the totem pole will be bumped off, so you'll end up with a higher ratio of calcium and a lower ratio of sodium in the soil. Even though we don't talk about it much, the lowest cation on the totem pole is actually hydrogen, which is pulled out of water to fill empty spots if there aren't enough other cations to go around. If hydrogen has to fill any negatively charged spots in your soil, that means you're soil is acidic. 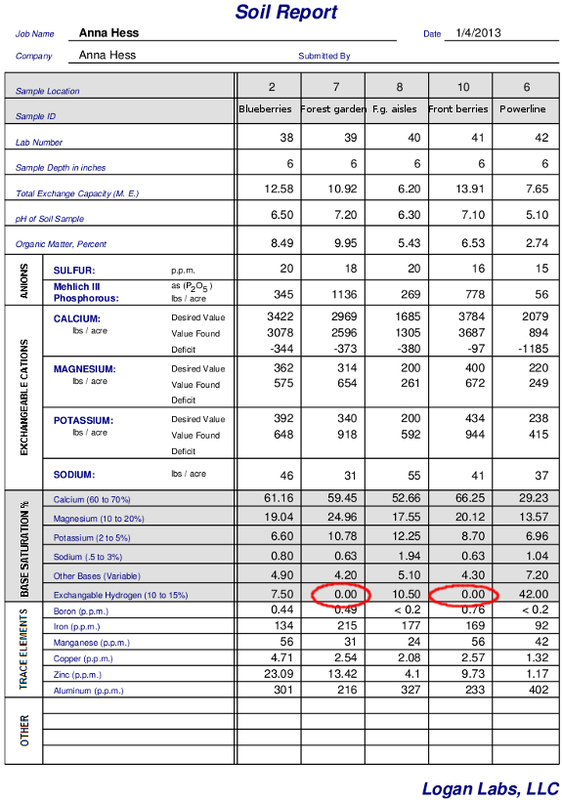 Take a look at my soil test results above and notice that the two samples without exchangeable hydrogen (circled in red) are also the samples where the pH is greater than 7, meaning the soil is alkaline instead of acidic. This is also why adding lime to your soil raises its pH. The extra calcium in lime knocks hydrogen ions back into solution where they merge with the carbonate ions from the lime to create water and carbon dioxide. Without those extra hydrogen ions hanging around, the soil is no longer acidic. The reason I've spent so long on this chemistry is because it explains how you can change the ratio of cations in your soil. Adding a stronger cation creates a cascade of other cations being kicked off the negatively charged spots in soil, and as long as you add lots of water to leach the unattached cations from the water, those cations disappear into the subsoil and leave the topsoil different than you found it. 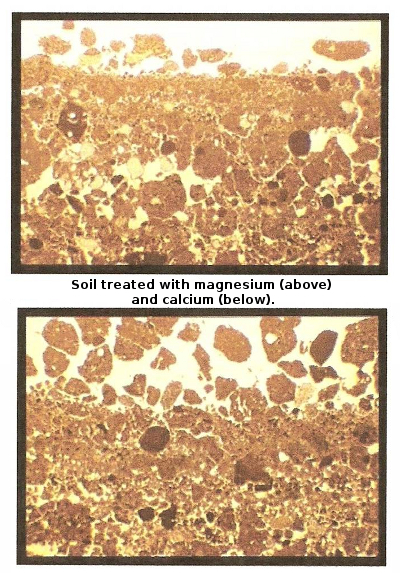 This can be handy if you garden on clay (like I do) and if your soil contains too much magnesium (like mine does), which tightens soil up and makes it waterlogged. Those of you gardening near the coast who irrigate with water high in salts will also find this handy since excess sodium can be even more harmful to soil than excess magnesium since high sodium levels tighten soil even more and can also be toxic to plants. Solomon's pet peeve has more to do with nutrient-density than with soil texture, though. He's found that leached soils are usually excessively high in potassium, especially if you add hay, straw, or wood products to your garden as compost or mulch. High potassium levels make plants grow fast, but the produce is low in protein, is high in carbohydrates, and is usually deficient in calcium and phosphorus. Livestock who eat plants grown on high-potassium soil gain weight but don't breed well, and people who eat from that type of soil tend to gain weight and have health problems as well. Stay tuned for more details on how to rebalance your soil for optimal nutrition. Need some lighter reading? Trailersteading shows how half a dozen families achieved. their dreams by living in used mobile homes. It's even a little bit more complex than you've decribed: the active transport enzyme systems that get the cations into the cells often operate on an exchange (Na-K or Ca-Mg) &/or competitive basis, so ratios may be as important as total concentrations. To say that prairie soil is healthiest is a bit of a tautological argument: the plants growing there naturally have adapted to make most efficient use of the ambient environment. To extrapolate that to say that crop species would benefit from natural prairie conditions may or may not be justified. Your final comments about health effects of soil chemistry doesn't pass close critical scrutiny, although it is true that performance (ie- wt gain) of beef cattle has been shown to be related to mineral ratios in their feed. Thanks for a great post, it really broke it down it made it easier for me to understand. I'm currently reading Steves book and was having a little trouble comprehending some this.